another outdoor campaign that i’ve shared with my clients recently. proud to say it’s done by McCann Japan and this campaign has won some awards in the region. another good piece of the work by our network! Concept: Generate buzz around Coke Zero’s Japan launch and increase vending machine traffic and revenue. Where: Most parts of Tokyo. – The campaign focused on the Coke’s vending machines, which have been a common sight in the country since 1962. 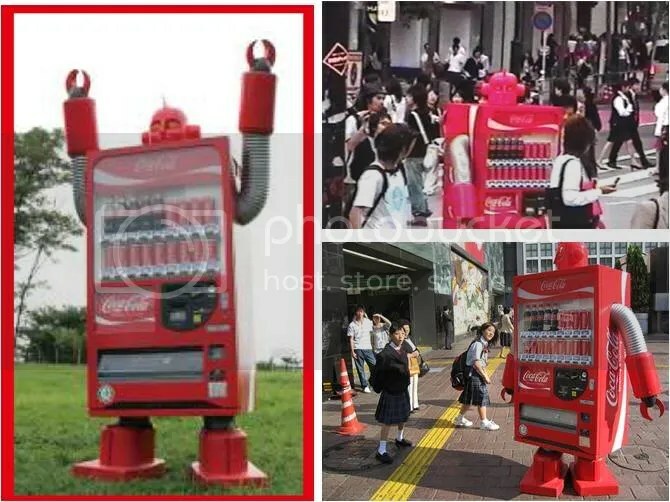 – The vending machines became an icon for Coke and vending machine ‘robots’ are created to communicate and interact directly with the consumers. – To make it more interesting, the ‘robot’ was given a name (VM Red) and its purpose was to travel around Japan thwarting fictional villains. – A total of 22 short films were uploaded on YouTube over the course of six months to reach out to more audiences. These films were between one and five minutes in length and featured VM Red battling villains or simply taking part in run-of-the-mill activities, such as shopping or riding the subway, giving the films a quirky edge. – Audiences were encouraged to participate by uploading either their clips of the robot filmed at live events or their own home-made episodes of VM Red. – Giving ‘life’ to a familiar icon (the vending machine) and making it possible for consumers to know Coke again. – Campaign also aims to foster a long term relationship between Coke and consumers. An account was created for VM Red on Japan’s most popular social networking site, Mixi. Red’s profile was updated almost daily with blog articles, movies and pictures for Japanese fans to follow. This allows fans to get involved with Red as a character to foster a relationship and strengthens the enthusiasm surrounding the character (and Coca-Cola). Key Learning: Coca-Cola created a character for their new product Coke Zero and it makes it easier for consumers to interact and have a relationship with the brand. Following this campaign, Coca-Cola revamped almost all of their machines by adding VM Red’s head on the top. ← Have a Jolly Good Xmas!